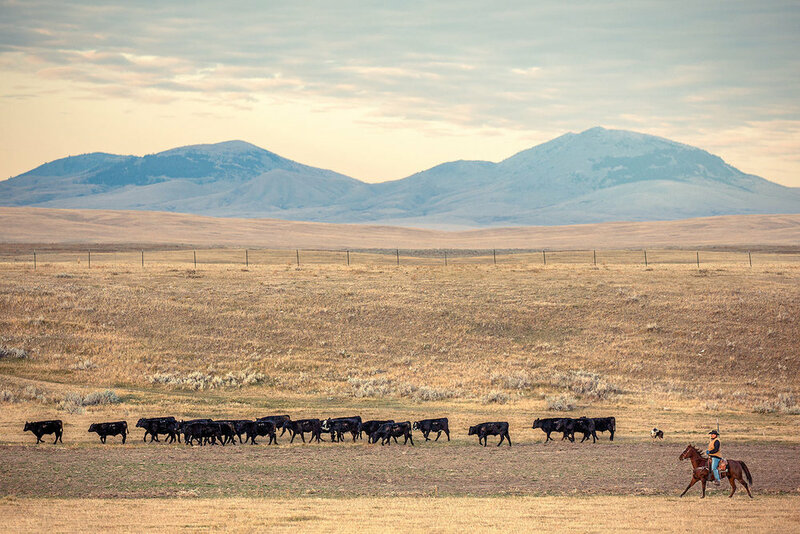 PLEASE NOTE: This is the entire unedited article I wrote for the July 2018 issue of Montana Magazine along with all of the ranching photos and photos of native American life on the ranch in Montana that appeared in that publication. Now that Montana Magazine has closed its doors, I am publishing all of my articles here for my blog readers. For those far removed from the rural American west, many great misconceptions about the history of cowboys and Indians exist. Hollywood movies over the years have convinced us that American Indian scouts can track any human or animal across any terrain, and that any good cowboy can hit a beer bottle tumbling through the air with his revolver. But perhaps the most damning of all the legends is the notion that cowboys and Indians were once at war with each other. The truth is this simply is not the case. While cowboys certainly armed themselves against both predators and rustlers, the fact is nearly all the armed conflicts with Indians involved the United States Army, not cowboys. Which is not to say cowboys and Indians have not had their problems over the years. Towns bordering Indian reservations were once the scene of much anti-Indian bigotry. And as farmers and ranchers built their homes on land between the Rocky Mountains and the Mississippi River under the guise of “manifest destiny,” something many Native American Indians saw as nothing more than an excuse to annex Indian territory. Thankfully, there are many more examples of cowboys and Indians getting along today than not. And in a few cases here in Montana, native American Indians are cowboys, too. Michelle Fox, whose family ranched on the Fort Belknap Reservation in north central Montana for generations, says that in many ways the Native American Indian was America’s first cowboy. According to Fox, Indians in Montana were riding horses long before the ranchers from back east settled here in the state. Montana’s Indians first received horses by trade with tribes in the south, who got their horses from the Spanish explorers, who first brought horses with them to North America. Native American cowboys started to appear on ranches in Montana in the mid-1800s when settlers all but killed every buffalo in the state. Until then, plains Indians such as the Nakoda (Assiniboine), Aaniiih (Gros Ventre), Niitsitapi (Blackfeet), Nēhiyaw (Cree), Apsáalooke (Crow), and Suhtai and Tsitsistas (Northern Cheyenne) relied on buffalo for sustenance and they were integral to their way of life. Already expert horsemen, some Indians had no other choice but to turn to ranching to help their families survive. Fox’s great-great-grandfather, Belknap Fox, from the Aaniiih tribe, was sent to Carlisle Indian Industrial School in Pennsylvania as a child. From 1879 to 1918 Carlisle was the most famous Native American boarding school in the U.S. as it was well known nationally for its football team, which featured the likes of Jim Thorpe and Pop Warner. It was at Carlisle where Michelle’s great-great-grandfather learned the art of cattle ranching. And upon returning to Fort Belknap Reservation he used that knowledge to ranch on his own. “He was a remarkable man. He is the reason why much of his family are still cowboys and cowgirls today,” Michelle Fox said. Jerome Bell and his wife Desiree, former high school sweethearts and members of the Nakoda tribe, are also Native American ranchers. And traditional cowboy culture runs deep in their veins. They have four children, all of which have worked by their side since they were young. John Bell, their only son, is a talented roper who competes around the state in the professional rodeo circuit. Their oldest daughter Emily still competes as a barrel racer today and also coaches the MSU-Northern rodeo team with her husband. Daughters Jenna and Katie are also accomplished barrel racers and once competed for the same team her older sister now coaches. Where did they get their passion for rodeo? From their parents of course, both of whom still compete in rodeos themselves. Jerome says his grandfather began the ranching tradition in their family. “He was active in rodeo but my father was not. Our entire family had a love for horses and that ultimately led to us raising cattle on our land,” he said. In fact, the brand Jerome uses today was inherited from his grandmother. On their ranch everything is done the old-fashioned way. They rope instead of using branding tables. They ride horses instead of using four-wheelers. And they use methods handed down to them from two or three generations of Native American Indians ranchers in their family. Jerome said keeping animals healthy and strong is the hardest part, and fighting with the weather, machinery breaking down, and long hard days of work. “But those are problems every cowboy faces,” he said. About the only difference is that they also have to deal with the Bureau of Indian Affairs, which they say can be very difficult at times. 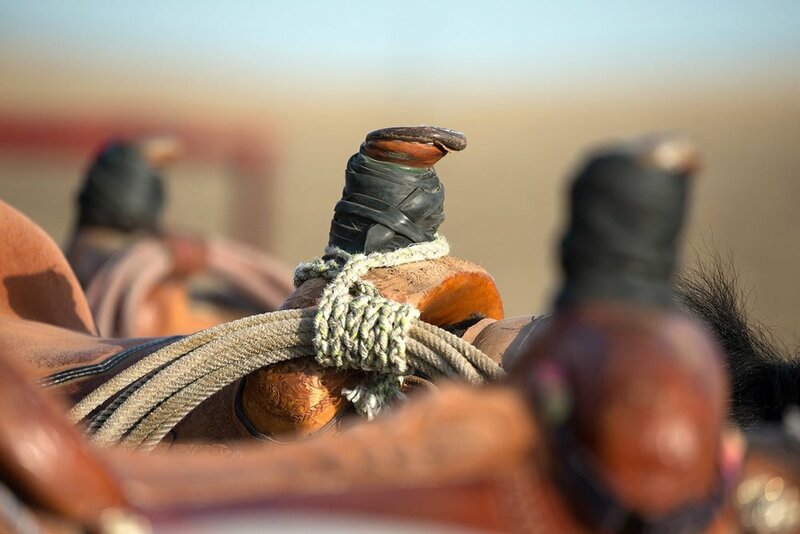 In their spare time the Bells teach the cowboy code and rodeo to new crop of children on the Fort Belknap Reservation, which culminates every July with the Snake Butte Youth Rodeo Association Rodeo, which they host on their property. 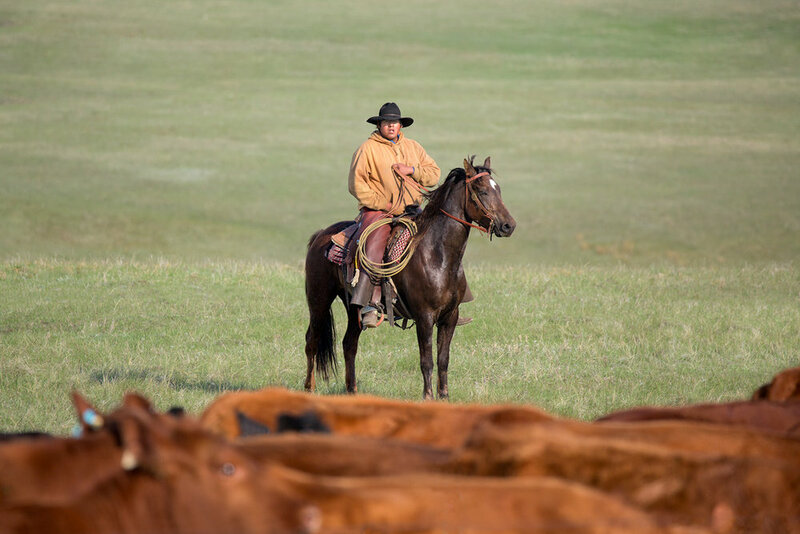 Native American cowboys have a rich history in America’s cowboy culture. Their contribution to the world of ranching and the world of rodeo is unmistakable. But their Native American roots are never forgotten on the Fox ranch. Every morning the Fox family starts the day with smudging, a traditional Native American ceremony and prayer practiced by many indigenous peoples throughout America and Canada. It involves the burning of sacred herbs, such as sweet grass and sage. The smoke is then used for spiritual cleansing or blessing, and to help protect their family as they work on the ranch. Elsewhere the Fox family is also active participants in other Native American events on the reservation, too.